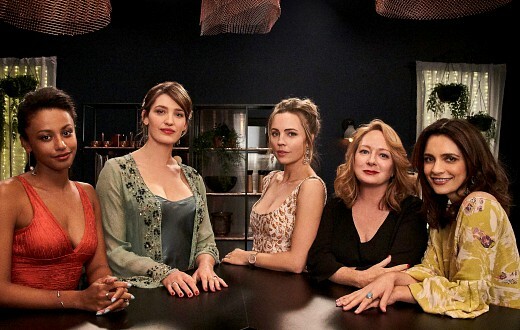 Nine’s Bad Mothers may centre around a murder mystery and a group of accused friends, but for Jessica Tovey, the title has another meaning, some of which goes to her character motivation. “It’s this thing that women do where they often don’t feel like they have got the balance right,” she suggests. “They are trying to be all these things, so they are not the perfect mum. They compare themselves to women who seem to have their lives together. The new drama series by writers Rachel Lang & Gavin Strawhan centres around 5 women as they struggle to deal with everything from careers and romance, to playdates and murder. Tovey, whose credits include Home & Away, Wonderland, Underbelly: The Golden Mile and Paper Giants: The Birth of Cleo, plays young mum Danielle in group of friends played by Melissa George, Tess Haubrich, Mandy McElhinney and Shalom Brune-Franklin. “Danielle is at the heart of the group. She is the maternal, mothering, one who brings them all together. They kind of know each other through her,” she explains. “She had a wild life of partying and drugs, but left that life and Hospitality as a result. “I’m not a mother myself yet so I have been watching other women and the way mothers interact with their children. Filming of the 8 part series by Jungle Entertainment and Filthy Productions took place last year in Melbourne, but Jessica Marais dropped out prior to production beginning. Her role quickly went to Tess Haubrich (Pine Gap, Wolf Creek) who played Sarah, wife of Anton (Daniel MacPherson) from the first table read. “It’s such an important part of the show so how do we let her know we’re here and supporting her? But I think we have all been very supportive in what is a fast turnaround show. I think we just got lucky,” Tovey continues. Yet with a murder at the top of the series what is the tone of the show? “It was one of the first questions I asked, ‘Is it a dark murder mystery? Dramedy?’” she recalls. “They are 4 women in very different stages in their life in terms of relationships and families. So you can have a darker shade for someone, and moments of comedy that keep coming through. “I think it took us a while to work out what the tone is and how to get it right. Some of the content we are dealing with is quite dark. Arriving in an era of #metoo Bad Mothers also maintains plenty of women behind the scenes. “Two directors are female. It is a very female crew. There are a lot of women in the camera and art departments, sound dept, continuity. “Having a balance of genders really changes the dynamic of a set. You can tell the energy is different,” says Tovey. “There are lots of components to #metoo. It’s not just about sexual harassment in the industry. That’s at the core of it but it speaks more largely to women finding their voice, and that’s something we should talk a lot more about. Nine is hoping Bad Mothers will find an audience and rejoin its local drama roster of Doctor Doctor and the upcoming Seachange and Halifax: Retribution. According to Tovey there is enough heart to the show to connect with viewers beyond the whodunnit hook. Bad Mothers premieres 9pm Monday February 18 on Nine. Thnaks for the insight as per always! Willinging to give this a go, as not all drama proposed this year appeal. I’m really looking forward to this, it looks really good.